Lately, the shores of San Francisco, California have been attracting more than wet-suit clad surfers and their boards. A site five miles off the city’s western beach is being considered for a new Oceanside Wave Energy project. Australian energy company BioPower Systems is collaborating with the City of San Francisco to investigate wave energy generation from the Pacific Ocean. If this project is indeed determined feasible—and it does look hopeful—BioPower Systems and the City of San Francisco will begin to develop a way to deliver clean renewable electricity to the city’s power grid. By 2012 that “hella rad swell” could be something electrifying. Click here to view a full animation of the bioWAVE farm in action. For millennia, Australia’s rugged southern coast has been carved by the relentless action of waves crashing ashore. The same wave energy could soon be harnessed to power towns and cities and trim Australia’s carbon emissions. 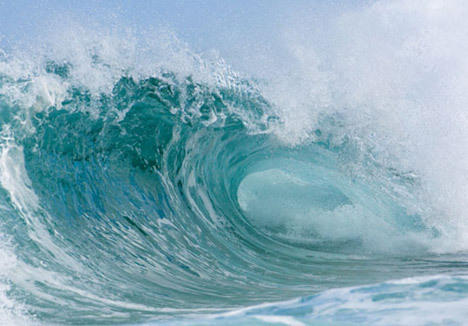 “Waves are already concentrated solar energy,” says Michael Ottaviano, who leads a Western Australian firm developing a method to turn wave power into electricity. “The earth has been heated by the Sun, creating wind, which created the swells,” he told Reuters from Perth, saying wave power had the potential to supply all of Australia’s needs many times over. Ottaviano heads Carnegie Corp, which has developed a method of using energy captured from passing waves to generate high-pressure sea water. This is piped onshore to drive a turbine and to create desalinated water. A series of large buoys are tethered to piston pumps anchored in waters 15 to 50 metres deep (49 to 131 feet). The rise and fall of passing waves drives the pumps, generating water pressures of up to 1,000 pounds per square inch (psi). This drives the turbine onshore and forces the water through a membrane that strips out the salt, creating fresh water in a process that normally requires a lot of electricity. 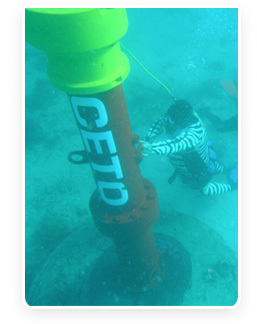 The CETO (named after a mythical Greek sea creature) pumps and buoys are located under water, differing from some other wave power methods, for example, those that sit on the surface. The CETO concept was invented in the 1970s by a Western Australian businessman Alan Burns and initial development began in 1999, followed by completion of a working prototype by 2005. Ottaviano says the company, which works in partnership with British-based wind farm developer Renewable Energy Holdings and French utility EDF, is in the process of selecting a site for its first commercial demonstration plant in Australia. The 50 megawatt plant, enough to power a large town, would cost between A$300 million to A$400 million ($193 million to $257 million) and cover about 5 hectares (12.5 acres) of seabed. Funding could be raised from existing or new shareholders, he believes. Several sites in Western Australia, including Albany in the south and Garden Island off Perth, looked promising. “There’s significant interest in these sorts of projects, even in the current financial environment,” he added. And a 50 MW plant was just a drop in the ocean. He pointed to a study commissioned by the company that said wave power had the potential to generate up to 500,000 MW of electricity along the southern half of Australia’s coast at depths greater than 50 metres (165 feet). At shallower depths, the potential was 170,000 MW, or about four times Australia’s installed power generation capacity. Interest in renewable energy in Australia and elsewhere is being driven by government policies that enshrine clean energy production targets as well as state-backed funding programmes for emerging clean-tech companies. “Australia is going to be one of those markets because of what the government is doing to drive investment in this sector. For starters, there’s quite a bit of direct government funding for projects like this,” he said. The federal government has also set a renewable energy target of 20% by 2020, which is expected to drive billions of dollars worth of investment in Australia over the next decade, with much of it going into wind farms. A second company, BioPower Systems, is developing underwater wave and tidal power systems and expects to complete pilot projects off northern Tasmania this year. 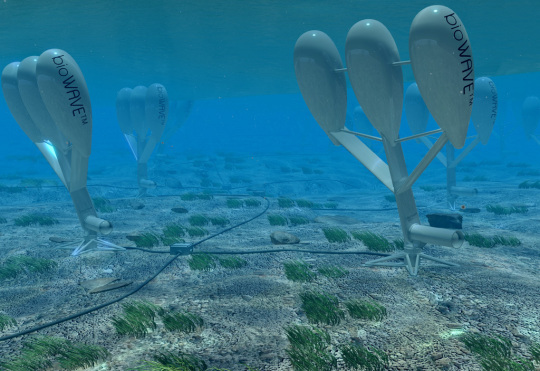 The company’s bioWAVE system is anchored to the sea bed and generates electricity through the movement of buoyant blades as waves pass, in a swaying motion similar to the way sea plants, such as kelp, move. Tidal power, in which electricity is generated by turbines spinning to the ebb and flow of tides, has not taken off in Australia, partly because of cost, but is expected to be a big provider of green power in Britain in coming years. Last week, Britain announced five possible projects to generate power from a large tidal area in south-west England. The largest of the projects could generate 8,600 MW and cost 21 billion pounds ($29 billion). Ottaviano believes wave power is one of the few green technologies that can provide steady, or baseload power. Wind and solar photovoltaic panels can only operate at 25 to 30% efficiencies because neither the wind nor the sun are permanently available. Government policies should promote the development of technologies that delivered large-scale, high-availability clean power competitively, he said. “If you look from an outcome point of view and leave it up to the market to work out how that is going to be achieved, it comes down to geothermal certainly being one of the potential technologies because (of) its high availability and also potentially cost-competitive and harnessable at large scale,” Ottaviano said. Australia has large geothermal potential in remote central and northern areas.